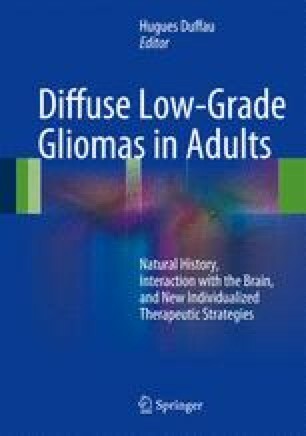 In this chapter, we review recent advances in biomathematical modeling of glioma growth, based on the proliferation-diffusion equation. We show how the computational simulations from this equation can be compared with real tumor evolution on MRI and how these simulations progressively integrate more realistic anatomical knowledge, improving the accuracy of the virtual tumor evolution. The Achilles’ heel of this model comes from the lack of quantitative relation between cell density and abnormal signal on conventional MRI, although future methods could overcome this limitation by taking advantage of multimodal sequences. In its simplified version, the model offers a practical way to monitor tumor dynamics, by estimating the velocity of the tumor front. We also envision applications to the management of DLGG, regarding model-based personalization of treatment sequence and evaluation of treatment efficacy in clinical studies. Finally, we propose a three-pathway model of malignant progression. One of these pathways has been recently mathematically modeled by the proliferation-invasion-hypoxia-necrosis-angiogenesis (PIHNA) system of equations. We show how this model leads to the important concept of kinetic grade, which is complementary to the usual histological grade.